It’s my birthday soon. And the holidays, for many who celebrate. Many people are wondering what to get for the undocumented relative or friend they have in their lives. And if you are looking to give money to immigrants and for immigrant justice, look no further. Ask Angy bracelets – Angy Rivera, who runs the only advice column for undocumented persons, sells bracelets to put herself through school. As someone who is now on a U-visa but formerly undocumented, she still does not qualify for federal financial aid or state financial aid. Julio Salgado’s art work – Support Julio, a queer undocumented artivist, whose art has been integral to fighting the deportations of many community members. You can check more of his artwork here. 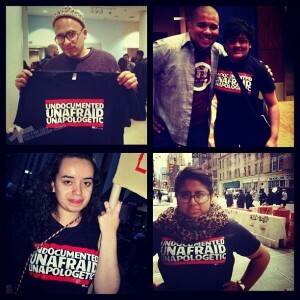 YLC “Undocumented, Unafraid and Unapologetic” t-shirts – These are my personal favorites. I’ve worn them for sit-ins, romantic dates, law school classes, and even graduation. Please make sure to buy your undocumented gear directly from the YLC and sister organizations, and not sites such as Zazzle. Dream Beanies – Jose Luis Zeyala crafts awesome beanies in order to raise enough money to pay for Graduate School. EnamorArte Crafts – This member of the undocumented community makes hand made leather accessories and jewelry. Donate – Never discount the power of a few dollars. DreamActivist LLC and many undocumented-led youth groups such as the Immigrant Youth Justice League (IYJL), New York State Youth Leadership Council (NYSYLC), California Immigrant Youth Justice Alliance (CIYJA) are driven primarily by grassroots support. And as far as I know, no one is paid a salary for the work they do as part of these groups so you are getting the maximum bang for your buck. Please feel free to add your own suggestions to this list by commenting.